Map of Africa, from the Latest Authorities. 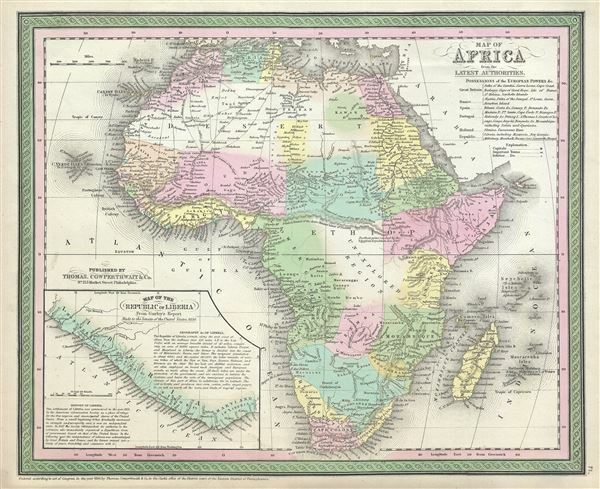 This is a fine example of Thomas Cowperthwait and S. A. Mitchell's 1854 map of Africa and Liberia. Details the continent of Africa on the cusp of the great exploratory expeditions of the mid-19th century undertaken by Speke, Livingstone, and Stanley. Much of the interior remains unknown, even speculative. The whole is engraved in Mitchell's distinctive style with green border work and vivid pastels. Political and topographical features are noted and color coded with elevation rendered by hachure. The 'Supposed Mountains of the Moon' stretch across the continent – a relic 5th century B.C. speculations regarding the source of the Nile. The course of the Niger is speculatively mapped along what is roughly its correct course. Lake Malawi, near Mozambique, appears in embryonic form, no doubt drawn from indigenous and missionary reports, but gives some hint of the Great Rift Valley lakes soon to be discovered. European colonies and outposts dot the coastlines and the great Arab caravan routes across the Sahara are noted. In the lower left quadrant there is a detail of Liberia drawn from Gurley's report. Liberia, which had been founded in 1821 as a refuge for free blacks from the United State had, just a few years previous in 1847, become an independent state and was an object of curiosity for Mitchell's largely American audience. Very good. Overall age toning. Minor spotting at places. Rumsey 3803.075. Phillips (Atlases) 809.